Are you an indie developer looking for free game art and graphics to use? Look no further; we have you covered. We’re going to reveal some of the top sites to download free game art along with a few of the best tips to follow to help you get the most of these free resources. When you’re an indie developer on a budget using free game art may be your best bet. However, there are a few quintessential tips that you need to follow to make the process as easy and stress-free as possible. The first tip is to come up with a basic idea or concept for your game before you start searching for free game art to download. Many of these game asset websites have thousands of different themed characters, backgrounds, platforms, weapons, sprites, icons, buttons, and more available. The combinations and possibilities are endless. So, it’s easy to quickly become overwhelmed when searching, especially if you don’t have a specific game concept in mind. Just like the saying, “Never go grocery shopping when you’re hungry,” the same goes for asset hunting. Don’t start your search for free game art until you have a specific game idea in mind. It’ll not only make the process easier and more pleasant, but it’ll also prevent you from wasting unnecessary time. If you’re having trouble coming up with a game idea, try to study some of the top games in the App Store or on the specific platform that you’ll be releasing your game. See what is trending and performing well on the charts. Then decide on a category and game theme that you’re interested in making. It’s okay if you have multiple ideas in mind, but try to narrow them down to no more than three. When you’re searching for free game art, try to only focus on one concept at a time. The goal is to have a basic idea of the type of game you want to create before you start on your quest for game art. The next tip is to figure out what you really need in terms of game art. Do you need everything? Or do you just need a unique character and some UI buttons? Maybe you can make your own game backdrop. Or you’re making a minimalist style game that doesn’t require a lot of graphics. Take some time to think about your concept and theme. Then make a list of all the assets that you’ll need for your game’s development. Much like shopping, having a list can save you tons of time and help keep you on track when you’re looking for game art. Also, it’ll make searching on various game asset resource sites as well as on Google easier, because you’ll have specific keywords and search terms to use. If you’re looking for ‘game backgrounds’ you’ll be browsing through countless results. However, if you enter ‘jungle theme background’ you’ll be able to find exactly what you’re looking for in less time and with minimal effort. Knowing what to look for is just as important as knowing where to look. When you’re using free game art, it’s always important to check the license use and attribution requirements, if any. Both of these can vary depending on the website. Sometimes you’ll run into a free game art pack that’s not for commercial use or game graphics that require attribution or credit to be given. To avoid any legal troubles or complications, be sure to check the website’s policy and usage guidelines. Also, review the file format before downloading. Remember, if you’re using Buildbox to make your game, the game art and graphics need to be in PNG file format, not JPEG. Okay, now that you know what to look for, let’s talk about where to go. Itch.io is an indie game and asset marketplace that offers both paid and free game art. The site has a vast collection of 2D, fantasy-based, sprites, and pixel art available. They also feature a variety of asset bundle packs. You can click on ‘free’ in the filter options to find over 1,000 free game assets. Itch.io is community driven, so each listing varies regarding use. There’s also plenty of free games that you can check out for inspiration as well. Another notable site to find free game art is Game Art 2D. This small asset store was created by indie game dev Zuhria Alfitra from Indonesia to help other developers in need of game art. There are over 100 2D royalty free images that you can download. Game Art 2D also has a freebies section with free themed sprites, tilesets, and UI buttons. If you’re making a space shooter game or platformer, it’s a great place to find cartoon style 2D art for your games. Also, most of the items in the freebies section are under a Public Domain license so you can use them freely. The GameDev Market is a large asset marketplace for indie developers that features both paid and free game art. Various designers and artists release bundle packs along with free individual game assets that you can browse through and download. They have a lot of high-quality art available. Similar to Itch.io, you can find all types of assets. Simply select 2D, 3D or GUI and click on the category you want. Switch the ‘type’ filter option to ‘free,’ and you’re set. There’s backgrounds, characters, vehicles, objects, environments, vegetation and more. CraftPix also offers free and premium game assets. You can easily find free game art in their fairly large ‘Freebie’ section. They have 2D game assets designed for arcade, strategy, platformer, RPG and just about any other genre you could want. CraftPix is notorious for their unique game art and themes. If your idea is a little on the creative side, this site is worth checking out. There are dozens of free assets from side-scrolling backgrounds and cool characters to GUI elements. It’s hard to talk about free game art without mentioning Kenney’s free assets. 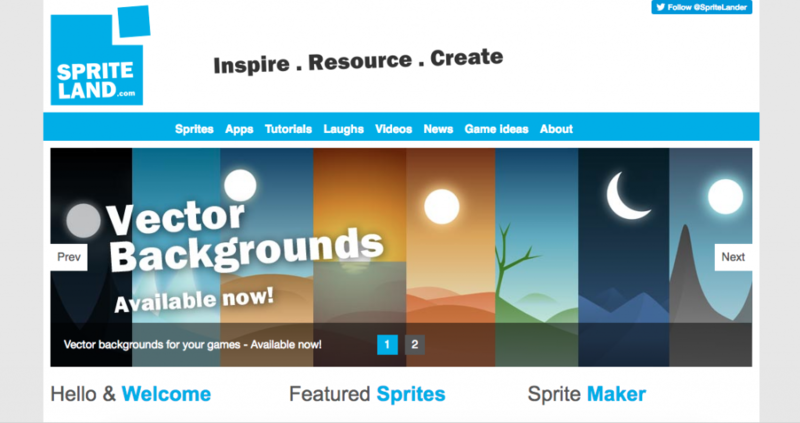 Since 2010, this asset resource site has been offering free game graphics and sound effects. They have a massive library with over 40,000 images, audio files and 3D models that you can download. There’s even free isometric game art available. When you download, there’s an option to donate to the website, but it’s not required. Due to their public domain license, the majority of their art is free to use in commercial projects without attribution. If you’re looking for a few additional game assets, Game Art Partners has a free game art bundle that you can download. The only requirement is that you have to sign up for their newsletter. Currently, their free package includes fully animated ‘Bro Stock’ characters, weapons, isometric objects, World War Mech level art, and much more. Ian Garstang’s Graphic Buffet is an online asset store with very affordable prices that also features free game art. Most of the free graphics were designed by Ian, who’s been in the design field for over a decade. At Graphic Buffet, you can snag some free spikes, blades, weapons, starships, furry creatures, and shapes. A great site to find free game art is Game Art Guppy. It was created by Vicki Wenderlich to help provide game devs who can’t afford custom art yet for their games, a way to get free or inexpensive art. You can find plenty of high-quality game assets for free at Game Art Guppy. There are colorful backgrounds, themed backdrops, characters, objects, UI, and platformer sets available. Game Art Guppy also features different perspectives like top-down, side view, and isometric. It’s a good starting place for any indie dev that is new to game development. Did you know you can snag free game art on Reddit? Yes, in Reddit’s subcategory r/gameassets you can find tons of free game assets that users from the community post. There’s a decent selection available, and everything listed is free. Browse through the threads for something that catches your eye. You never know, you might find exactly what you’re looking for. It’s worth a try. You can also find free game art at OpenGameArt.org. Don’t let this website’s layout fool you; this site is a massive free repository for game assets. Most of the assets are under a public domain license, so they’re free to use in commercial projects without credit. There’s an active community of users that vote and favorite different assets. Often the most popular items will appear first. So, if you’re looking for unique game art try to adjust the filter options to view new or lesser-known assets. Although, Glitch is dead, the game’s art has found a way to live on forever. You can download over 10,000 art assets and animations from the 2009 game called Glitch. The game was shut down in 2012, but the developers decided to make the game’s assets available for free. Depending on the type of game that you’re trying to make, it might be worth checking out. If you’re in need of icons, Game-Icons is the place to go. This site has over 3,000 free icons that you can use for your games. All of the images can be downloaded in vector format so you can easily edit and customize. Change the colors, blur, shadows and more. There are also dozens of new icons added weekly. Crevasse is a Transylvania-based indie dev studio that makes apps, game art, and even Buildbox templates. They have an Isometric Art Pack available for free that you can download. This free game art pack features over 100 elements, gradient backgrounds, platforms, objects, characters, and user interface buttons. It’s entirely free for personal or commercial use. If you’re making an isometric game this freebie is worth checking out. An excellent place to find free game art like sprites to use is at Sprite Land. Sprite Land is a site dedicated to sprites. They have tutorials, apps, and lots of free graphics that you can download. There’s a wide assortment of sprites available. You can find animals, robots, dragons, soldiers and other fun characters to add. Sprite Land also features rich backgrounds that you can use in platform games. For those RPG fans, Super Game Asset Store has a variety of role-playing based assets available. Although, primarily a paid site it does feature a small free game art section. You can download free icons, items, and equipment with options to buy the complete sets at a later time. This marketplace also has decent prices and a nice assortment of fantasy themed art. Mobile Game Graphics (MGG) is another marketplace that features both paid and free game art. At MGG it’s all about various themes and bundles. Whether it’s pixel aliens or cute cartoon monsters, they have a bundle package for it. In their ‘Free Stuff’ section, you can download free backgrounds and characters ranging from zombies to superheroes. Game asset marketplaces aren’t the only sites that have free game art. You can also find hidden gems on free image sites like at OpenClipArt.org. 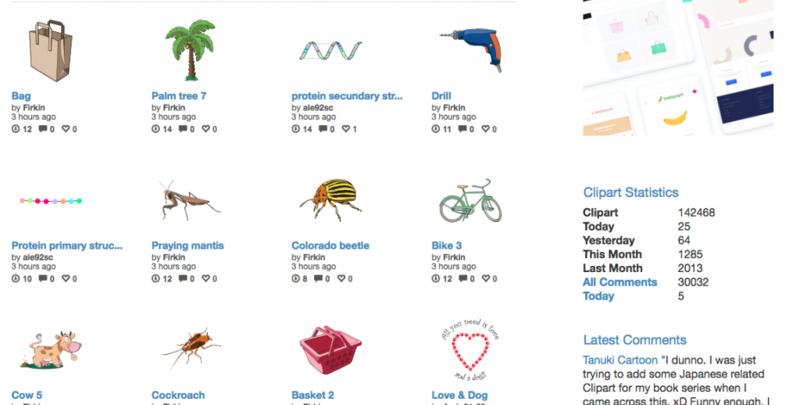 This site has over 100,000 free clip art images that you can potentially use in your games. You can find all sorts of images using the search box. Just type in what you’re looking for and get ready to be pleasantly surprised. Free photo sites like 1001FreeDownloads or even Pixabay can sometimes have cute animal vector sets or basic backgrounds that you can incorporate into your game. If you know what you need, these type of sites can become a smorgasbord of free game art. You can search for photos, vectors, fonts, icons, wallpapers, patterns, textures, clipart and more. Reiner’s Tilesets is free game asset site that’s been around for years. It was created by a hobbyist game developer who was frustrated because he couldn’t find the graphics that he was looking for to complete his game. So, he started making his own graphics and sharing them on the site for free. Reiner’s Tilesets features tilesets, sprites, 2D graphics, and sound effects to help make isometric games. If your project falls into that category, it might be worth checking out. Last on the list is Creative Game Assets. It’s a small asset site that features both paid and free game art. In their ‘Free Assets’ section, they have several high-quality button packs, swords, shields, game elements, landscapes, and themed platforms available for download. If you’re an indie developer looking for free game art, you can use sites like these to help you get started. Try to come up with your game concept first. Make a list of the assets that you need. And remember when you’re searching for free art to check the license and attribution requirements before downloading. Also, don’t forget to have fun! Thanks for sharing. HP Printer Offline Problem with your HP Printer it show offline issue. We are Here to help you any type of troubleshooting HP printer offline problem. Our Technical team 24*7 Ready to fix your HP Printer offline problems. I would love to see a game created by the Great Tiana Crump.. I have a feeling it would be BIG! Thanks Hue! :) Me too, definitely. Thanks :) Thomas, glad you found it useful. Yes, it is. Glad you liked it AndyG. :) Thanks! Great Post! Very useful info!